This recipe makes simply the best buttercream frosting! Even if you don’t think you like buttercream, this frosting will win you over! 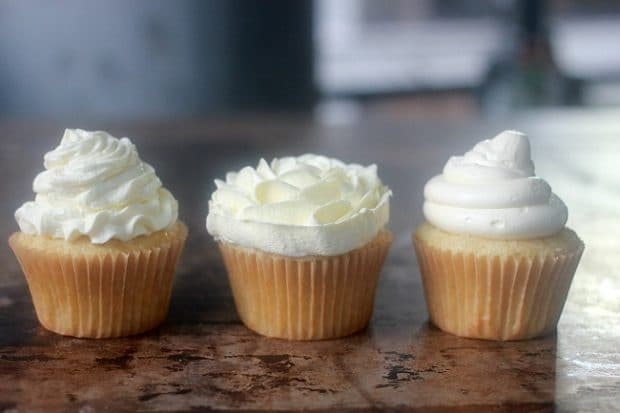 This is the best buttercream because it is not sickeningly sweet or overly rich like many buttercream frostings, it works well for cupcakes or cakes, pipes out easily, is silky smooth and fluffy, and holds its shape well! I have to be honest here, I have never liked frosting. Even as a child, I have always been the person who scrapes it all off and just eats the cake. But in my adult life, I have been on a mission to find frosting that I don’t hate. I’m here to tell you, this frosting is it. This is the buttercream for buttercream haters and lovers alike! My reservations with every buttercream I have ever eaten is that it is always sickeningly sweet and too rich in butter flavor. I just said that. “Too rich in butter flavor.” Who am I? But as much as I LOVE butter, and I do really love butter, there truly is such a thing as too much butter flavor. So I am here to present to you the buttercream for people who don’t like buttercream. This is also a buttercream for people who love buttercream, because if you like frosting in general you are going to love this! 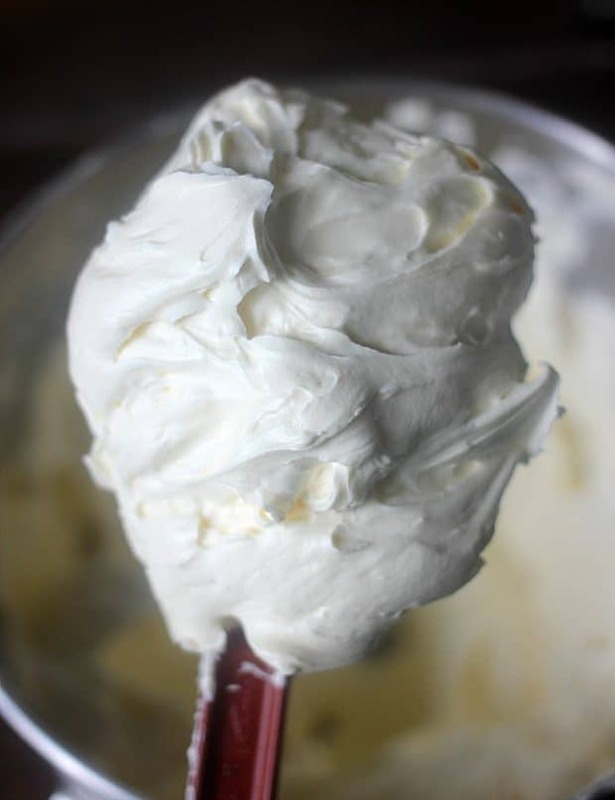 This truly is the best buttercream for several reasons: it is insanely silky smooth and fluffy, has just the right amount of sweetness, can be piped and hold its shape, and has a good balance of butter flavor without being overwhelming. I may be well on my way to becoming a frosting person with this one! And I want to show you how to make it perfectly! The idea that you should use real butter when you want to make really good buttercream may sound like a no-brainer. But I am a child of the 80’s/90’s who honestly didn’t know until I was in college that the big tub of spreadable “butter” in our refrigerator growing up wasn’t really butter, it was margarine. Please don’t use margarine in this recipe! Buttercream is one of those recipes with very few ingredients. Whenever you are making something that only requires a couple of ingredients, the quality of those ingredients becomes much more important. Use real, unsalted butter for the best buttercream. Though not absolutely necessary, this is also a very acceptable time to use high quality European style butter. I used some unsalted Kerry Gold for this frosting and it was a great decision! If you are already a buttercream lover, using mascarpone in this recipe is totally optional. I think you should try it once and see how you feel about it, because it is so dang good! But that is your call, you could use all butter if you prefer. If you are like me, and are on the hunt for a buttercream frosting that doesn’t make your stomach churn, then this is not optional! The mascarpone in this recipe is key and is the ingredient that really helps to balance the flavors of this frosting. It ends up tasting rich and luxurious, but not overly sweet or buttery. 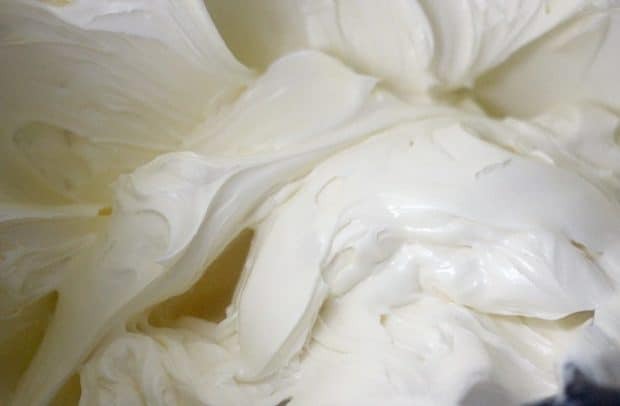 I first learned about using mascarpone in buttercream from an interview with the owners of the famed Robicelli’s Bakery in Brooklyn. They are definitely onto something! For this buttercream, the fat is split between butter and mascarpone cheese 60% to 40% respectively. I find that this ratio truly does give the perfect balance of buttery richness that you are looking for in a frosting without overwhelming your taste buds. I keep thinking that this frosting tastes almost like a hybrid of buttercream frosting and whipped cream frosting. And that actually makes a lot of sense since mascarpone is essentially a solid version of heavy cream. The key to making any buttercream frosting successfully is to start with truly room temperature ingredients. You don’t want ingredients that are almost room temperature but still have a little chill on them. You also don’t want ingredients that you nuked in the microwave a little too long and are warm or even hot. All of this is a recipe for disaster with buttercream! The very best way to ensure you have perfectly room temperature ingredients for your buttercream is to leave them out on the counter overnight. I’m fully aware that it requires planning, but if at all possible, do this! Ideally, you will let your butter, mascarpone (if using), and cream sit out for 2 hours at the very least before making your beautiful fluffy buttercream. It is the best way to ensure your buttercream success. However, if you absolutely have to, you can use your microwave to get your ingredient temperatures down. To bring your ingredients to room temperature in the microwave, set it to 30% power and heat each ingredient separately in 10 second bursts, checking the progress after each 10 seconds. Baking Science Tip: Butter is an emulsion, meaning it is a stable mixture of two ingredients that will not mix (fat and water). If the butter is too cold or too warm when you begin whipping it, it will cause the emulsion to break and the fat and the water will separate. Before you start the process of adding the sugar into your buttercream, you really want to cream the fats together for a good amount of time, about 5 minutes. The process of creaming the butter, and mascarpone in this case, serves a couple of purposes. This process whips air into the fat and creates a much lighter and silkier texture for your buttercream. This process is also what helps make your buttercream appear more white. You will notice as you whip your butter that the yellow color becomes more and more pale. One of the things that I am so impressed with when I make this buttercream is just how silky it is. The texture feels quite luxurious! The process of creaming the butter and mascarpone is a key part of that, but sifting your powdered sugar is also an important part of this! Measure out your sugar first, and then sift it. If you do not have a sifter, you can also use a whisk to break up any clumps. It isn’t quite as effective as sifting, but it will do the job! Once your butter, mascarpone, and cream are fully whipped, then you can start adding in your sugar. I suggest doing this slowly with the mixer running. This will help ensure that you don’t end up with a gritty texture to your buttercream and also ensures that your powdered sugar won’t go flying everywhere! You will notice that this recipe lists a sugar range for how much to use. This really depends on your preference for sweetness and what you want to do with the buttercream. Once you get to the minimum amount of sugar, 2 cups, stop, taste, and add more sugar as desired. More sugar will give you a more stiff buttercream that might be more suitable for piping intricate designs. However, I used the minimum amount of sugar and it still worked well to successfully pipe a buttercream rose! It is quite a soft and airy texture though, which I love! And even at the full amount of sugar I didn’t find this buttercream to be as sickeningly sweet as many other recipes out there. Once your buttercream is whipped up and sweetened to your preference, you can flavor it as you like! Vanilla is an obvious choice, but you could use this recipe as a base to make many other flavor options. Almond extract, coconut extract, cinnamon, pumpkin pie spice, or any other extract or spice would all be great addition. See the notes section of the recipe for a few variation ideas! This recipe makes simply the best buttercream frosting! Even if you don't think you like buttercream, this frosting will win you over! This is the best buttercream because it is not sickeningly sweet or overly rich like many buttercream frostings, it works well for cupcakes or cakes, pipes out easily, is silky smooth and fluffy, and holds its shape well! In the bowl of a stand mixer fit with a paddle attachment, beat the butter, mascarpone cheese, and heavy cream together on medium speed for 5 minutes. Scrape down the bowl at the halfway mark. It is extremely important that your ingredients are at room temperature before staring this process or your butter will break. Meanwhile, sift your powdered sugar. With the mixer running on medium speed, add your powdered sugar 1/4 cup at a time until you have incorporated 2 cups of it. Stop the mixer, scrape down the bowl, and taste your buttercream. Continue adding sugar slowly until it is at the sweetness you prefer. More sugar will create a more stiff buttercream, but it will still hold its shape well with only 2 cups of sugar. Use immediately, or you can also put it in an airtight container in the refrigerator for up to 1 week. If you refrigerate your buttercream, let it come to room temperature and whip it again at medium speed for 1-2 minutes until fluffy! Notes: : *If you do not want to use mascarpone cheese you can leave it out and increase the amount of butter by 8 oz. Flavor Variations: Vanilla Buttercream Add 2 tsp vanilla extract after you have added your sugar and beat until incorporated. Chocolate Buttercream Measure out 1 cup of cocoa powder (you can use natural or dutch-processed cocoa powder) and sift it. After all of your sugar has been incorporated, slowly add the cocoa powder while the mixer is running on medium speed until all incorporated. Almond Buttercream (perfect for wedding cakes) Add 1 tsp almond extract after you have added your sugar and beat until incorporated. Pumpkin Spice Buttercream Add 2 tsp pumpkin pie spice after you have added your sugar and beat until incorporated. Espresso Buttercream Stir 1 TBSP instant espresso powder into your heavy cream until it is dissolved. Continue onto step 1 of the recipe. Mocha Buttercream Stir 1 TBSP instant espresso powder into your heavy cream until it is dissolved. Continue onto step 1 of the recipe. While your butter, mascarpone, & heavy cream are whipping, measure out 1 cup of cocoa powder (you can use natural or dutch-processed cocoa powder) and sift it. After all of your sugar has been incorporated, slowly add the cocoa powder while the mixer is running on medium speed until all incorporated. thank you, I am going to try this, the last couple of frostings that I did make did have mascarpone cheese in them, I love the flavor! Hi Janet! It does add such a nice flavor doesn’t it? This method is definitely my go-to now! I have ruined this frosting 9/10 times in my life! Thanks for this method. I’ve been there myself, Andy! You’re very welcome. Hello there Aphrodite! I have to be honest here, I do not have a lot of (or really any) experience covering cakes with sugar paste. So I don’t want to lead you astray here. What I will say is that because of the mascarpone in this frosting, it stays soft and fluffy. It doesn’t really harden like other buttercream frosting sometimes do. I would imagine that you would want to use the higher end of the sugar on this if you do want to try using it for a cake covered in sugarpaste. If you do try it, let me know how it goes! If the cake is not going to be eaten within a day, then yes, it should be refrigerated. OhhHhMaGOSH! I cannot wait to try this! I accidentally found out about using mascarpone in using. BUT it was in my cream cheese frosting. I totally thought I had enough cream cheese to make my recipe. NOPE. I did have 8 oz of mascarpone. Used it. LAWDY! So so good. not as sweet, more creamy and had a texture to DIE. My DIL, a self proclaimed lover of cream cheese BUT hater of cream cheese frosting, was gaagaa googoo over my rendition with the mascarpone. Your comment made my day, Stephanie! You are so welcome! Enjoy it all! ok this frosting looks fantastic, I love the texture and I never would have thought about the marscapone! Must try! Well thank you lady! And yes, MASCARPONE! Give it a try! You’re so welcome Judy! I hope you enjoy it! Hey! I found your recipe and i want to try it tomorrow to fill and frost a 3 tier cake. I just have a question. The amount of mascarpone in grams is 96. Is it a mistake? It seems too little! Thanks in advance! Oh my goodness! Yes, that is a HUGE mistake! I just updated it. It is 224 grams. Not sure what happened there. Thank you for bringing it to my attention! You may decided you want to add slightly more sugar if you are going to use it to fill the cake. You might want it slightly more stiff. Let me know how it goes! Hi!! I’m really excited to try this recipe but I was wondering do I need to use all 3 sticks of butter or can I just use 2? Hi Courtney, you can use just 2 sticks of butter. The frosting will be much more sweet and a little stiffer. Do you think this would still work if I upped the mascarpone content and reduced the butter? Say stuck to two sticks of butter and added another 100g mascarpone? Yes you can definitely reduce the butter. It will be more of a whipped cream texture/flavor, but it will be delicious! Hi. I want to make some cupcakes for a baby shower. Can I make this frosting, pipe it, then refrigerate the cupcakes until the shower which takes place at least 5-6 hours later that same day? Do I need to let the cupcakes return to room temperature before serving? Will the frosting collapse? I loved it . 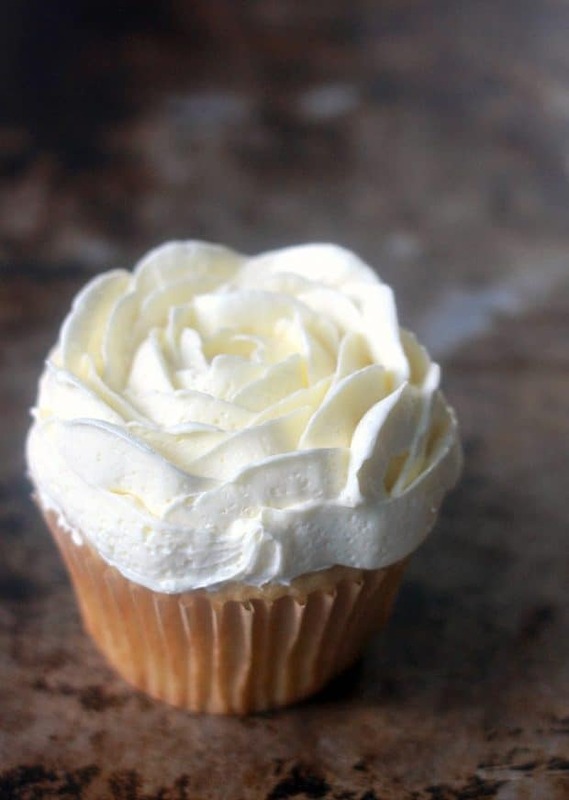 I have a question, I need to to make red roses so can one color this frosting? Will it break the consistency of it? Hi Monica! You can definitely color it! I would use a gel food coloring for the best results. Just note that this is not a crusting buttercream and it will remain soft at room temperature. If you want it to crust over, you will want to use a traditional American buttercream. Hi, can you color this buttercream? Hi Lulu! Yes, you can color this buttercream. I recommend using gel food coloring because it is very concentrated and won’t dilute the buttercream. Quick question: is this amount enough to both fill and cover a cake? Hi Roxana! This is enough to cover and fill a 2 layer 9″ cake! I can’t wait to make this, I’m going to use it for my niece’s wedding cake. It looks absolutely luscious!! Awesome Sandy! It will be delicious! Do keep in mind that this buttercream will not crust over like American buttercream. It is so delicious though! Yes I made it, am not a cheese lover plus it tasted a little bit strong in the buttercream frosting, but overall I really liked because it was something new that I did. Glad you enjoyed it Lucy! Does this recepee need to be refridgerated? Hi Kayla! If you are not using it right away, it does need to be refrigerated. Allow it to come back to room temperature before using and serving. Hi, on the added flavors below. You have for the almond, to added 1 tsp of vanilla extract??? Also can you use the whip attachment instead of the paddle? Hi Stephanie! Thank you for letting me know, that should read “almond extract.” I have updated it! You can use your whip attachment but it will make a much lighter frosting that will be more of the texture of whipped cream! Hi Holly! I’m sorry you are having issues after refrigerating. I have never had that happen. After the 3 hours, was it still pretty cold? Also, are you using a whip or a paddle attachment in your mixer? I am just learni g about high ratio shortening. Could I substitute for butter? I am so anxious to make this. 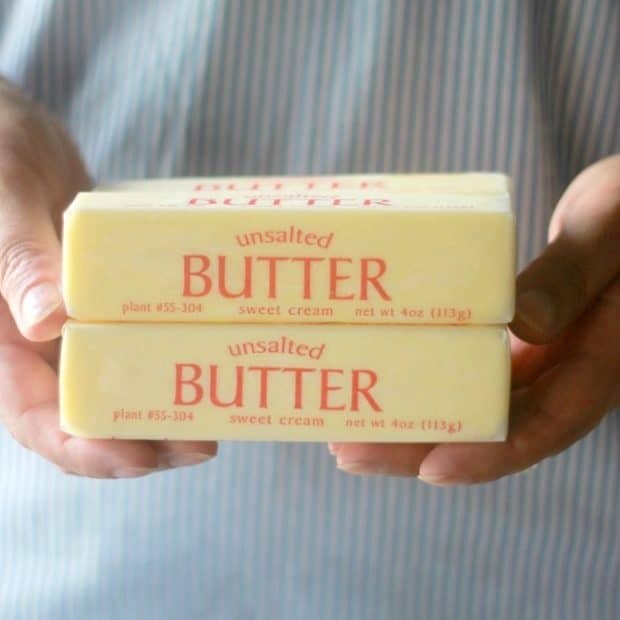 Question…can I incorporate Hi-Ratio Shortening for perhaps one stick of butter? Hi Ramella! You certainly can, but the mascarpone cheese in this recipe will still make it fairly unstable in the heat. I would search for a recipe that specifically calls for high ratio shortening if you will be serving this in the heat. I wanted a lemon buttercream, so I substituted lemon juice for the cream and added zest from 1 lemon. I needed to add a little more sugar to make it thicker using the lemon juice, but it turned out AMAZING! So fluffy and the flavor was great. I can’t wait to try the original vanilla recipe. Hi Nicole! That sounds delicious! I’m so glad you enjoyed the frosting. Can I use salted butter instead of unsalted butter? It’s what I have on hand. Also what difference would it make on the outcome of my frosting? Thanks. Hi Leslie, I wouldn’t recommend salted butter for this frosting. It will likely taste too salty. You technically can and it won’t affect the texture but it will affect the flavor. 1. Can I use this as Macaron cookie filling? 2. Can it be frozen for later? Hi Joelle, yes this is great as a macaron filling and you can freeze it. You will need to let it thaw completely and then re-whip it! I had trouble. I had my butter and Marscspone cheese at room temperature 4 hours. When I creamed them, they really didn’t want to come together. I added the sugar and that didn’t help. It looks like cottage cheese. I don’t think it’s safe to use in a cake. Hi there! Typically you want about 1/4″ thick on the sides and a 1/2″ thick on the top. If you are only doing 1 layer I think you could halve this recipe. Loved this frosting!!! Best frosting ever. I frosted the night before the party, chocolate cake and chocolate frosting. Coated the cake and piped the border. In the morning all held very well. I saved frosting to finish decorating for the next morning. Noted for my future use… I would finish decorating the whole cake the night before I need it. The extra frosting I saved for embellishing the cake once it came to room temperature had a curdled texture. I whipped and whipped (way more than I expected) it again and all was well, however the unexpected time factor set me way back. I be adding this to my favorite list. Thank you. That’s so great Nancy! I love it so much too! I’m glad it whipped back together for you! 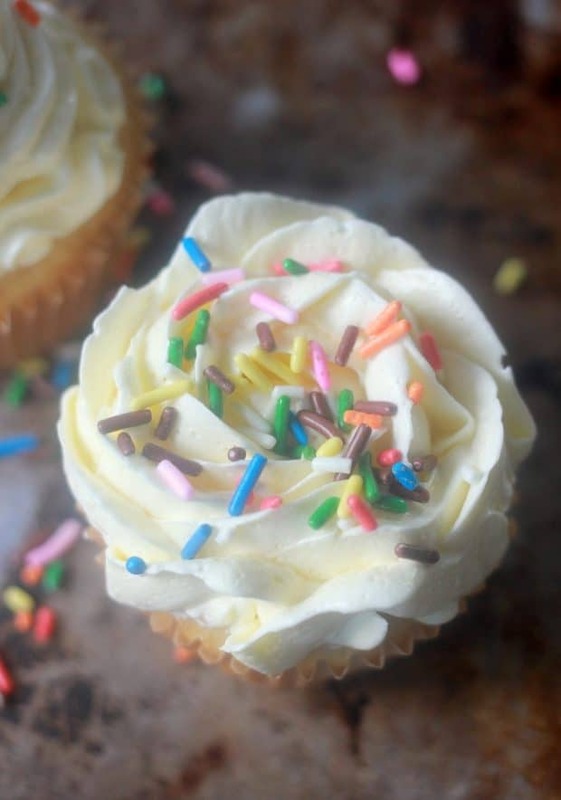 I came across this frosting of yours by accident on Pinterest and cannot wait to try this buttercream although having trouble locating the mascarpone! But I’m on the hunt and won’t give up til I find it. My question for you is I’m going to make a sponge lemon filled Jellyroll cake for Easter and would like to frost it lightly ( like a crumb coat) then use a lemon ganache over top just enough to slightly dribble down sides. Do you think if I used the higher end of sugar that the ganache would cause your frosting to slide down? I would put on ganache as cooled as possible to still get the effect. Then pipe around bottom of cake and possibly on top of ganache after cooled for decoration. Although haven’t really gotten that far yet in planning. I really want to use this frosting but just wanting to get your thoughts on this??? Hi Irene! Usually you can find mascarpone in the “Fancy cheese” section of the super market! While I haven’t tried what you are suggesting, yes I do think it would work. I would use the higher end of the sugar as you suggested! That sounds delicious! Thanks so much for your reply and yes I did find the mascarpone in the deli cheese section at a different market! I’m crossing my fingers on this ganache and I will definitely let you know how it goes! Have a Happy Easter.